Key West’s Love Lane begins in the shadow of the public library on Fleming Street and runs south for a single block to Southard Street. Not quite a right-of-way, the crooked alley doglegs through private property near its middle, where you’ll find the offices of the Key West Literary Seminar and Sand Paper Press. The lane’s literary character goes back much further, to the heady days of the Cuban Revolution nearly 125 years ago, when the Spanish-language press known as La Propaganda operated out of a single-story frame house located at 730 Love Lane. La Propaganda was closely allied with the 19th-century Cuban Revolutionary Party led by José Martí, a charismatic orator, influential poet, and brilliant politician. More than a generation before Fidel Castro, Martí sought to free Cuba from Spanish rule and establish a democratic state founded on humanist ideals, where people of all races and creeds would live as equals. The populist movement’s heart and soul lay in Key West, where roughly half of the island’s population was born in Cuba or had at least one Cuban parent. Shortly after the armed phase of the Cuban War for Independence began in 1895, the Love Lane press issued a twenty-five-page tract entitled The Cuban Revolution and the Colored Race. Released under the anonymous byline “a Cuban without hatred,” the book offers an overview of race relations in Cuba under Spanish rule and promises that blacks and whites will have an equal say in the governance of an independent Cuba. Today we know the book to have been the work of Manuel de la Cruz, a poet, essayist, and biographer who was active in Key West during the period. 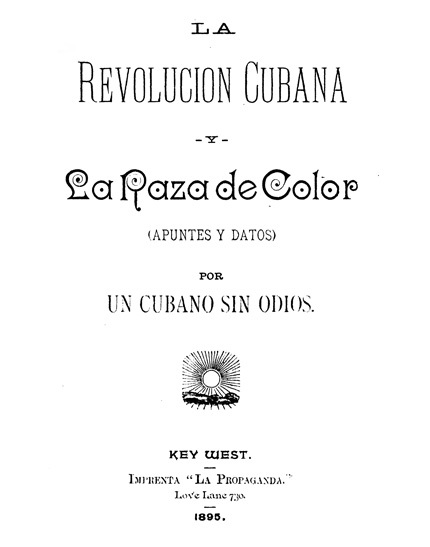 Title page for “The Cuban Revolution and the Colored Race,” published by Love Lane’s La Propaganda Press in 1895. Harvard University Library. Typographical similarities suggest that La Propaganda may also have published the text of an important speech delivered by General Carlos Roloff Mialofsky. Roloff was a Polish-born refugee from the Russian Empire and embodied the democratic mien of the party, which also counted Afro-Cuban, Dominican, Mexican, French, and American generals among its leadership. Roloff’s 1892 address “To the Honorable Council of the Revolutionary Party and its Allies,” included a visceral appeal to Key West’s growing population of Eastern European Jewish immigrants who, like Roloff, had fled the tyranny of Tsarist Russia and who came to provide financial and military support for the Cuban cause. In 1896, La Propaganda issued The Cuban War (Its First Year), a meticulous, often day-by-day narrative account of the progress of the war from February 1895 to February of 1896. Author Lorenzo G. Del Portillo summarizes the war’s notable battles, including the tragic death of Martí at Dos Ríos on May 19, and provides a financial accounting of the war to-date. After nearly four years of fighting and the last-minute involvement of the United States, Cuba was officially granted its independence in December of 1898, leading thousands of Cubans to leave Key West and resettle in their newly free homeland. The Love Lane printing press of La Propaganda probably relocated around this same time to Havana, where a publishing house of the same name continued to operate in the years following Cuba’s independence. This entry was posted in Key West’s Life of Letters and tagged Paper under the Palms. Bookmark the permalink.